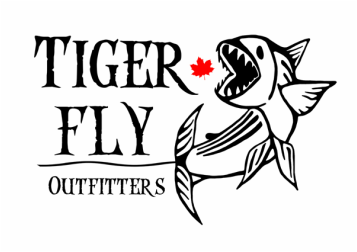 Tiger Fly Outfitters was officially opened for business on January 1st, 2014 to provide top quality, custom tied flies to the fly fishing community throughout northern BC, North America, and the rest of the world. Using only top quality hooks, thread, materials, resins and glues Tiger Fly Outfitters works with a team of experienced Canadian tyers to produce custom flies of the highest caliber. Durability is one of our top focuses and very important to the Tiger Fly team. Many of our flies are finished off with Deer Creek's UV resins, ensuring the fly will never fall apart at the thread head. Our tyers are all avid fly fishermen who are consistently testing our products for durability, fishability and effectiveness. Along with that we have a network of guides, fishermen and other fly tyers throughout the world to offer advice on what flies you need for any destination you desire to fish. If you don't know we will do the research for you and tie what you need for that trip of a life time. 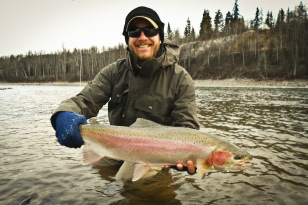 Born and raised in northern British Columbia, Canada - a fly-fishing destination of note – Luke began fishing at the age of 3 and fly fishing from the age of 13. With a deep passion for the sport of fly fishing it was only natural to pack a fly rod when he left to Botswana (southern Africa) in 2006 to do volunteer work. During his time there he learned to fly fish for many different species, including Tigerfish on the Okavango River in northern Botswana. On his first trip to the Okavango he met two guides from South Africa (who he wasn't fishing with) and by the end of the week was offered a job guiding with them the following season. It was a dream come true! He jumped at the opportunity and spent 3 seasons on the Okavango guiding for Tigerfish, and other species. In 2012 Luke made the move back to Canada to have the first of two total hip replacements at age 26. It was not easy to leave Botswana, but it had to be done. After a long complicated recovery, hips sorted out, he's set up shop in his home town of Smithers, BC, Canada tying custom flies, and working as a freelance fly fishing guide. Born and raised in northern British Columbia, Canada, Riley developed a passion for fly fishing and tying through one of his teachers who gave his fly tying tools and materials to Riley on the condition that he would tie him flies in return. Tying and fishing with Luke has influenced his attention to detail and concepts, while still bringing his own ideas to the table. Even though Riley has only been tying since 2013, small, intricate trout flies that imitate the different stages of aquatic insects have proven to be his strength. His patterns have proven to be highly effective throughout northern BC. Particularly on the Stellako River and several different lakes and streams throughout the Spatsizi Wilderness.